For over 14 years the Gota Kanal Steamship Company has been in operation, cruising the canals, locks and lakes that cut across Sweden, and today provide a classic and cultural experience for passengers who embark on the journey between Gothenborg and Stockholm. 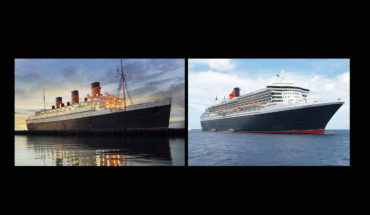 The company’s prized vessel is the M/S Juno, first launched in 1874 and continues today as the world’s oldest passenger vessel with sleeping accommodations still in operation. M/S Wilhelm Tham is the next oldest vessel in the company’s fleet of three boats, launched in 1912. Finally, the youngest boat in the fleet is the M/S Diana, built in the Finnboda shipyard not far from Stockholm in 1931. 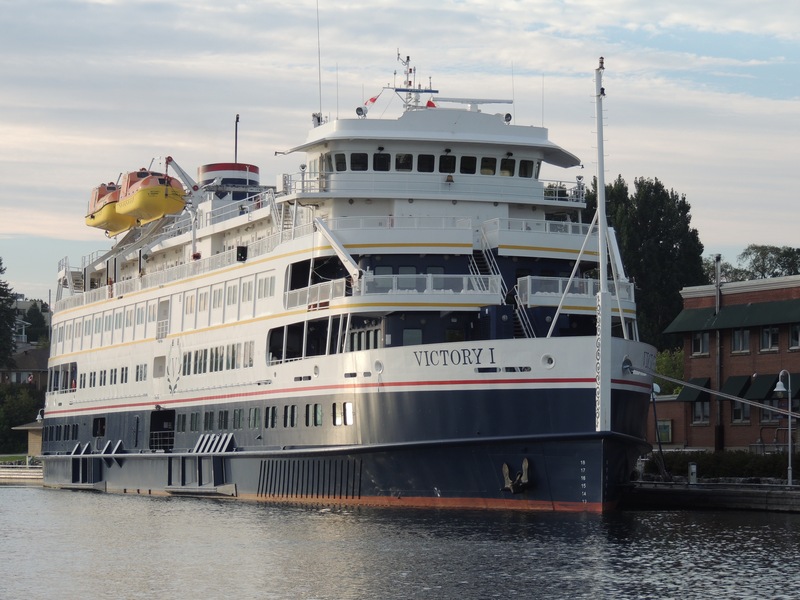 Borton Overseas, in Minneapolis, Minnesota recently offered me an opportunity to experience this iconic journey with Gota Kanal, aboard the Diana’s first cruise of the season from Gothenborg to Stockholm. 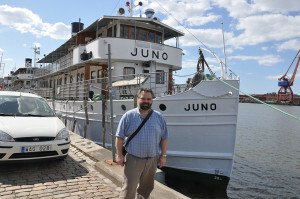 As an ocean liner and classic passenger ship enthusiast, cruising the canals of Sweden on an eighty-year-old vessel like the Diana had a certain romance to it. Boarding the Diana in Gothenborg and being greeted by the staff pier-side on a red carpet, was a great introduction. Upon presenting a boarding pass, your name is checked to see if it is on the passenger manifest, then Kjerstin Lundwall, the Guide and Tour Manager, welcomes travelers and vacationers aboard, while a crew member carries your luggage and escorts you across the gangway. The moment I stepped aboard the Diana, I felt as if I were stepping back in time to a simpler era. With 28 cabins on three decks and a passenger capacity of about fifty, it was clear this journey would be an intimate, and exclusive experience. 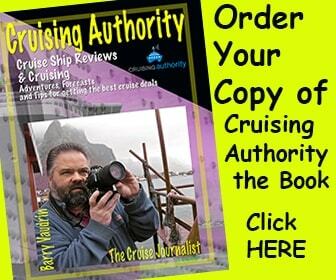 There were many notable passengers, according to Captain Ake Foghammar, who have experienced this Gota Kanal journey, including Hans Christian Andersen, the famous author and poet, the King of Sweden and Teresa Heinz the wife of U.S. Senator John Kerry, to name a few. On this particular voyage there were two governors from a couple of Swedish providences, a couple from Australia, and a good mix of people from Germany, Switzerland, Sweden, the U.S. and England. One couple purchased a new Volvo from the factory in Sweden, and chose to also see the country aboard the Diana with Gota Kanal. The CEO of the Gota Kanal Steamship Company, Hakan Gullberg, was also onboard, celebrating the first cruise of the season. Mr. Gullberg said his company is part of the Stromma Group, one of the largest tourism companies in Sweden. The history of this steamship company is fascinating, and equally amazing are the locks and the canal that stretch across Sweden. The first lock was built in 1800 with very primitive technology, yet very ingenious techniques, and hard labor. 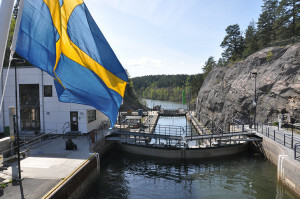 The lock and canal system transformed Sweden’s commerce, allowing for more cost-effective transport of goods and materials from east to west and back again. 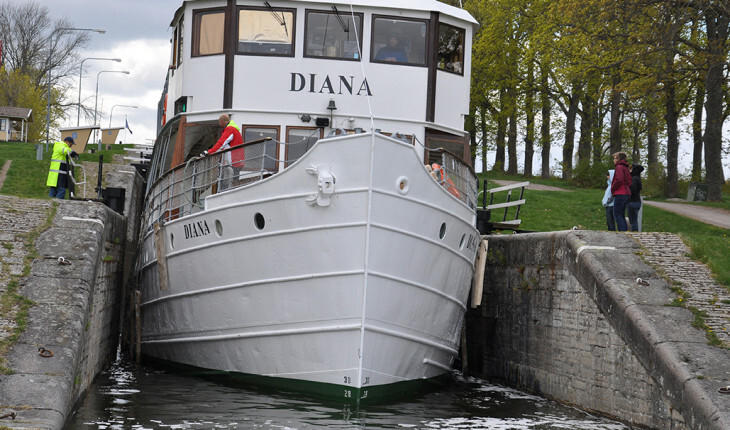 Wooden log fenders line the sides of Diana, protecting the hull, as she occasionally glances against the lock. Passengers on the Gota Kanal vessels will experience these locks and canals, and gain an up-close appreciation for the rich history that envelops each little town along the journey. From the comfort of a wicker chair, the teak deck of the Diana, the gentle hum of the motor and sounds of the water trickling by; all these elements will calm the senses and offer a relaxing, enchanting experience. The Diana still maintains her wooden railings with brass fittings and continues on like she has done for eighty years. Unique to a Gota Kanal journey is the intimacy and community that develops onboard among fellow passengers. With the absence of television, internet and modern-day electronics, the main focus is relaxing onboard, fine dining and a sense of community. At 268 tons and with only 28 cabins, Diana is not a large vessel, so gathering on deck, the main lounge, or at meal times are the perfect opportunity to engage in conversation with fellow passengers. The community onboard, the dining, and the culture of the locks and canals are the featured entertainment. A fascinating element to the Diana is the extraordinarily small passenger cabins. Some of the old cruise director jokes on cruise ships about how small the passenger’s cabins are, comes to mind as I sit in my tiny little room A14, on the Diana. The sleeper cabin on a train is larger than the sleep compartments aboard the Diana. 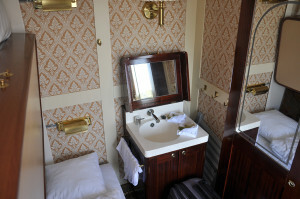 Don’t get me wrong, the beds in these compact cabins on the Diana, are very comfortable and the linens are wonderful, however; most passengers will only use these rooms to sleep and maybe freshen-up using the small wash basin. Reminiscent of the Victorian era, occupants will enjoy the classy wall-trimmings, hard wood framing, a cold and hot water washbasin with a wooden cover, and brass hooks for hanging a coat or bathrobe. There’s also a very shallow closet for hanging a suite or dress. With so little space to even stand in these cabins, a suggestion is to pack a smaller carry-on suite case and slip it under the bed for storage, because the larger bags will not fit. For the passenger accommodations on the Bridge and Sheltered Decks, cabin doors can be propped open with a hook allowing for fresh air to circulate, or the door can be opened completely offering a view of the passing scenery. For privacy the cabin doors can be closed or a curtain can be slid in-place while the door is open. 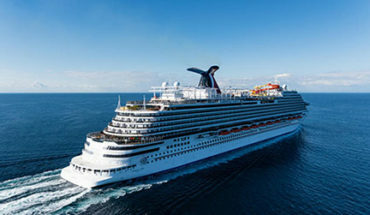 Cabins have no toilet or shower, so passengers must use a community bathroom and shower located on each deck. These tiny bathroom facilities are also very compact, yet well maintained and cleaned throughout each day. A good perspective on these tiny cabins is that passengers will not spend much time other than freshening up or sleeping, rather; more time will be spent on deck socializing with fellow passengers and enjoying the sites of this historic lock and canal system. 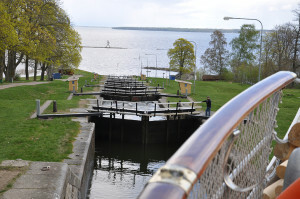 Cruising the locks and canals aboard any of the Gota Kanal Steamship Company vessels is saturated in the Swedish culture, which includes traditional Swedish cuisine. The highlight of each day aboard the Diana, for example; was breakfast, lunch and dinner. A common element to Scandinavian dining is fish prepared in many ways including pickled, fried, baked, poached, and certain menus include specially prepared raw fish. Onboard the Diana we enjoyed a fixed menu, however; for those with special dietary requirements and made arrangements in advance, vegetarian entrées were available. Seating was assigned during lunch and dinner, yet for breakfast, which is buffet-style, passengers could sit wherever they wish. A classic tradition is the ringing of the dinner bell. The waiter or maitre d’ will walk the decks ringing a bell or gong to announce that it’s time for dinner. Some of the characteristic sounds onboard during lunch and dinner is the click-clacking of the dumb-waiter delivering the prepared meals from the galley below. Dining aboard the Diana was a first-class experience with crisp white table linens, fine tableware, and the wait-staff are dressed in white jackets with black and gold epaulets and gold buttons. Fine spirits, cognac and wine, were also available for an additional cost to enhance the dining experience. There was the occasional beef or poultry entrée, however; the majority of cuisine was fresh local fish. The Chef in the galley, one deck below, prepared each entree with artistic flare and included fresh cooked vegetables, potatoes and the perfect accompaniments for each main dish. 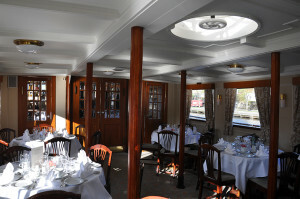 The dinning room itself aboard these Gota Kanal vessels, has an intimate, friendly and classy ambiance, yet without exception, passengers will enjoy a delightful social experience, a highlight of this special Swedish journey. 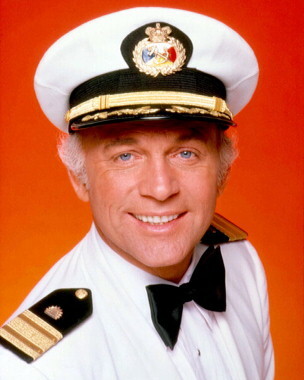 The crew aboard the Diana were genuinely proud to serve each passenger. In Stockholm, at the conclusion of our cruise or journey across Sweden on this historic and charming vessel, with the red carpet rolled out just past the gangway, the entire crew of the Diana stood in line to shake our hands and hug us as if we were family. At the very beginning of the journey when we embarked on the Diana in Gothenborg, as I stepped aboard for the first time, I felt like we were about to experience something special, and upon disembarkation in Stockholm my premonition was clear and accurate. I think my fellow travelers also experienced a camaraderie unique to this journey, where the rich heritage and culture of Sweden came alive aboard the Diana. The Gota Kanal Steamship Company, and the crew of the Diana indeed offered somewhat of a time-travel experience reminiscent of a simpler era. It was clear that the folks who live in the small towns along the canal passage saw the Diana as a gleaming and proud representation of their rich culture and heritage, and consequently, our fellow passengers clearly experienced that sense of exclusivity and pride of participating in the journey. 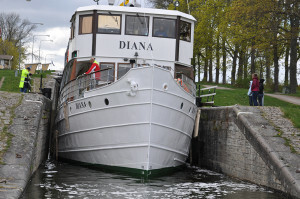 Below is a video of the Gota Kanal experience aboard the Diana. Please enjoy the video and share it with your friends.